Winning never goes out of style as you take up your special invitation to enter Mr Green’s playground where you will mingle with the mysterious man himself, see his trappings of success and most importantly – become wealthier during your stay! 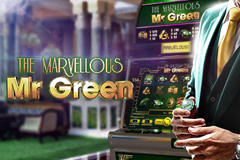 This free Marvellous Mr Green slots machine celebrates the finer things in life as you get to lounge around his impressive mansion, join him flying high in the sky in his bi-plane and enjoy the thrill of doing nought to sixty in no time as he puts the foot down in his luxurious car. His name is Green and it’s clearly his favourite colour too as it dominates the art-deco design of the reels which are trimmed with gold in this nostalgic slot. The structure of 5 reels and 20 paylines is a popular one from NetEnt with it enabling you to hang out with the casino giant from as little as 20p, while high limit slot punters will be happy too as the max bet stands at £100 per spin. While it has been developed by NetEnt, it’s important to note that you can only play The Marvellous Mr Green for real money at Mr Green Casino so if you don’t have an account already we suggest getting one as you could find yourself leaving his mansion with up to 463,050 coins! You can play the free Marvellous Mr Green slot machine here with no download needed as it showcases all the trappings enjoyed by the self-made man on the pay table. This includes his trademark bowler hat which acts as the Wild symbol and can substitute for all standard symbols, however there are other special symbols to be aware of which it cannot substitute for. One of these is Random Multiplier symbol which can boost winning combinations by 2x up to 5x while the other is a Mr Green casino chip which acts as the Scatter symbol. If you’re really lucky you’ll find Mr Green showing his generous side by giving you stacks of gold bars which have a value of up to 2,000 coins. Staying at his mansion sees you rewarded with up to 1,200 coins, joining him for a road trip in his luxury car is worth up to 900 coins, flying high in the bi-plane brings rewards worth up to 600 coins and if you help him find his trademark green umbrella you’ll be rewarded with up to 400 coins. Ace to 10 icons have also been included which sparkle in gold and these range in value from 150 to 50 coins, although I can’t help thinking NetEnt could have replaced these with fine wines and other items of luxury the great man enjoys instead. Mr Green casino chips are dotted all around his mansion and if you manage to locate three or more of them at the same time he will reward you with Scatter wins and a fabulous free spins feature that includes a multiplier meter. Three Scatter symbols (chips) earn you 2x your stake, three are worth 4x your stake, four sees things get really exciting with 25x your stake, while the maximum of five chips will see you scoop 100x your stake – and that’s before you enjoy big wins from free spins. Rather than being given a pre-determined number of spins according to the number of chips that you find, Mr Green again goes all to showcase his generosity here as he lavishes you with unlimited free spins. Of course, nothing lasts forever but they will only end once you land the hand icon on the multiplier meter which appears on the fifth reel. Fingers crossed you keep dodging that as the other segments will see winning combinations boosted with a multiplier bonus worth between 2x and 6x! The Marvellous Mr Green will have you savouring win after win just like the main man savours his fine wines! Mr Green Casino is regarded as one of the best and most reliable online casinos and it’s well worth joining so you can play The Marvellous Mr Green in addition to other Mr Green exclusive online slots that have been developed by NetEnt including Mr Greens Grand Tour which sees you travel back in time to explore Europe with him and Mr Green Moonlight which sees him seek vengeance against the vicious werewolf that brutally murdered his wife!